Monthly Temperature Departures in 2018 for Peoria. The year started with bitterly cold temperatures that struggled to climb above zero on January 1st. Temperatures moderated back into the teens for the next several days but remained well below average before temperatures briefly spiked into the 50s and 60s on January 10th and 11th before dropping once again. While no significant snow storms blew through Central Illinois through February, several smaller systems brought Central Illinois 6-12 inches of snow to the area. The snowy weather pattern continued into March where Peoria received another 9.3 inches of snow. To top off what already seemed to be a long winter, another winter storm brought snow to areas along and south of I-74 on Easter Sunday, the heaviest falling across Fulton and Mason Counties. Including the snow that fell at the end of December in 2017, Peoria received 32.1 inches of snow through April. With temperatures well below normal throughout the month, April was the 6th coolest April on record for the Peoria area. Monthly Percent of Normal Precipitation in 2018 for Peoria. Central Illinois went from one extreme to another in what seemed to be a blink of an eye. Temperatures reached the lower 80s on April 30th and never really seemed to drop. Through the month of May, temperatures remained above average for all but 1 day and ended up with an average temperature that was 9.3° above average, making it the warmest May on record. The rest of the Summer season was warm and muggy with very little severe weather. Above average rain fell in October across the region leaving Peoria with it's 6th wettest October on record. Central Illinois also saw it's first flakes of the season on October 12th. While no measurable snow was reported, it was a sign of things to come in November. Thanks to several rounds of snow, including an early season blizzard at the end of the Thanksgiving holiday weekend, Peoria received 9.8 Inches of snow in November making it the second snowiest November on record for Peoria. As we rolled into December, it seemed like 2018 was going out with a bang! Just one week after an early season blizzard swept through the region, a powerful storm system brought a record-setting 29 tornadoes to Illinois, nine of those striking the WMBD viewing area. 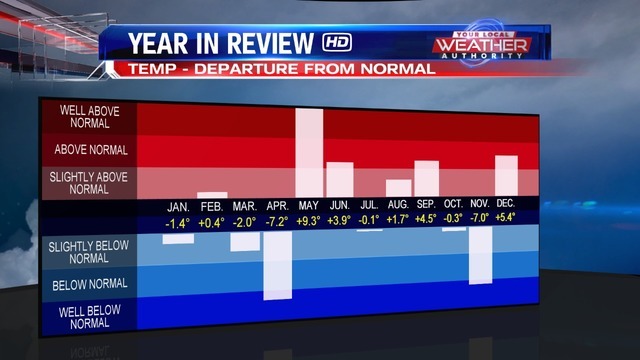 After that, the rest of the December was eventful with below average snowfall and above average temperatures. 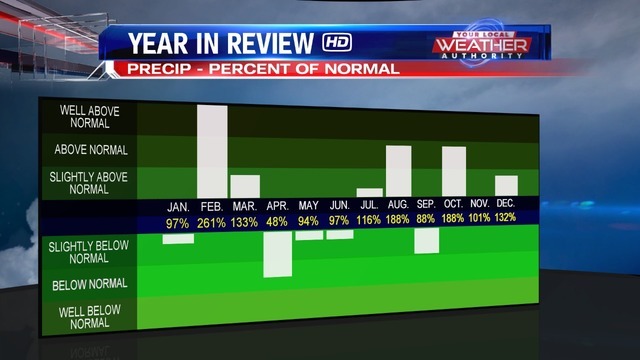 In the end, it was a warm and wet year in Peoria with an average temperature that was more than 7° above average and 44.32" of rain, which is 7.83" above average. 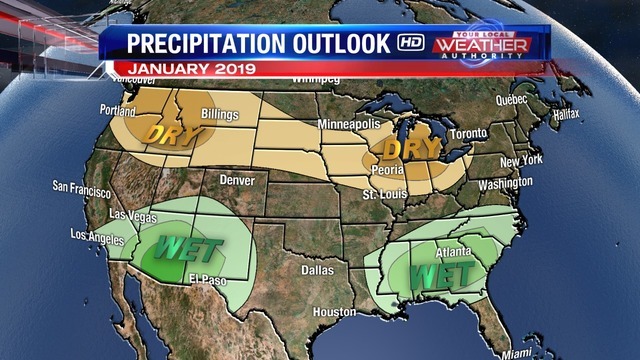 The Climate Prediction Center is calling for below average precipitation across Central Illinois through January. As for temperatures, the CPC is expecting above average temperatures west of the Illinois River while the forecast is a little more uncertain elsewhere. It appears that above-average temperatures and limited chances of accumulating snow will remain in place across Central Illinois through the first two weeks of January. We may experience colder and snowier weather in the second half of the month. Hows the Winter Outlook Looking? So far my 2018-2019 Winter Outlook is on track. Early in November, my forecast called for a few early season snowfalls followed by a mild and less snowy December. While my winter outlook is looking good so far, the accuracy of my prediction will depend on what happens from the end of January through February. 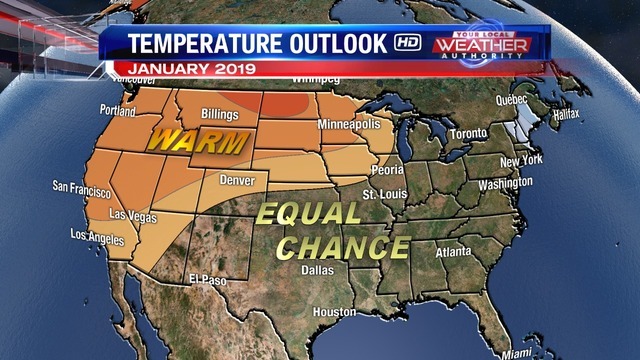 My winter outlook called for near average temperatures and snowfall in January and below average temperatures and above average snowfall in February. At this point in time, I see no reason to change this.